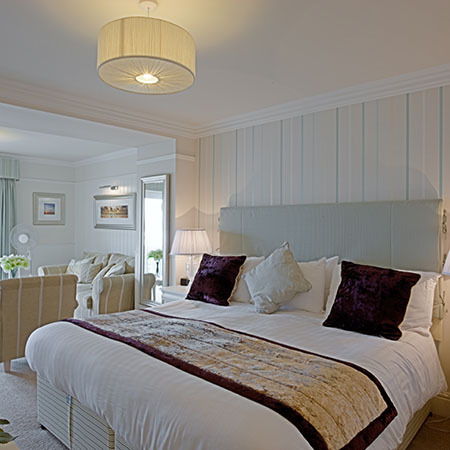 The Trearddur Bay Hotel is situated in a prime position overlooking the beach on the North-West coast of Anglesey. We have 47 bedrooms, many with fabulous sea views and balconies and all with the comforts you’ll need for a relaxing break. Make the most of your stay with a stroll around the bay, a trip to one of the island’s attractions or simply enjoy great food and drink in the comfort of the hotel. 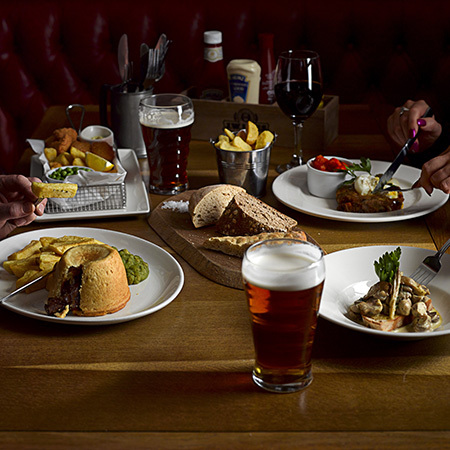 Our own quirky little pub, the Inn at The Bay is great for grabbing a bite to eat before heading out with our Winter menu filled with seasonal, hearty pub food favourites. You’ll find award-winning cask ales, quality wines and a back bar brimming with premium gins and spirits. There’s also the option of The Bay Restaurant, which has its own menu that focuses on daily, fresh, seasonal specials, for a special dining experience. We have fantastic space for events, parties and coastal Anglesey beach weddings. Our great location, overlooking the beautiful sandy bay of Trearddur, is the perfect venue for your celebration, party or beside the sea wedding. Head over to our Weddings & Events page for more information and to book. There’s always something interesting going on here at the hotel, to make sure you don’t miss out on any upcoming events, look at our What’s On page. There’s also plenty to get up to whilst you’re here. For ideas on what to do, where to go and sites to see, check out our Explore page. We’re lucky enough to be situated right in the centre of the beautiful Trearddur Bay. Being just a stone’s throw away from the beach, there’s no better place to enjoy a relaxing getaway and take in the stunning views that some of our rooms have to offer. Enjoy a stroll along the award-winning beach and take in the fresh sea breeze. One night stay in a standard room £179 for Dinner, Bed & Breakfast or why not upgrade to a deluxe balcony room with seaview for £219 Available from Thursday 14th February to Saturday 16th February 2019 Call our Reception Team now and surprise your loved one! 2 night’s accommodation in a standard double/twin room for 2 people. Dinner for two in our Bay Restaurant each evening. Full Welsh breakfast each morning. Delicious chocolate Eater Egg in your room. Why not upgrade? Join us for the Easter weekend for a delightful three night stay, with the sea at your doorstep. Package includes a dinner allowance of £50.00 per night, plus a Chocolate Easter Egg , and a chilled bottle of Prosecco in your room £510 for a Standard Room or upgrade to a seaview room for £555, or why not book a deluxe room for £585 Offers are subject to availability and full prepayment is required on booking, which is non-refundable and non-transferable. Amazing hotel, great staff, lovely food, beautiful views, great facilities for families and the room we stayed in had all 6 of us together. Had an amazing time with my family and made some extra special memories. I can't fault this Hotel and highly recommend to everyone i know. Can't wait to visit again soon! A nice hotel in a wonderful location. Right next to the sea front, the beach is a place where you can relax all day and watch the world go by. Great hotel, comfortable rooms and a great Welsh breakfast. Dog friendly and the staff were helpful throughout my visit.